Desktop management at any scale is a tedious job. Imaging, reimaging, and troubleshooting desktop systems consume valuable IT resources, and keep employees from being productive. Securing the information generated on desktops, tablets, and smartphones is no simple job either. Many organizations are deploying virtual desktop infrastructures (VDI) for these reasons. But for deployment to be successful, computing and storage infrastructures must deliver high-quality, predictable, and productive user experiences. Often, the best way to accomplish this is through flash-based storage solutions due to its low latency/high IOPS nature. Unfortunately many IT professionals aren't sure what type of flash array is best for their needs or how to ensure that all elements of their VDI work seamlessly. 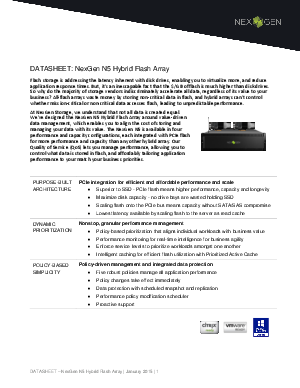 Download now and learn how to validate a provide VDI configuration across NexGen N5 Hybrid Flash Array, VMWare Horizon View, Cisco Unified Computing System™(UCS), and Cisco Nexus Switches.